We are excited to share that Minturn is currently being completely rewired! The house previously had 100 amp service, which was not going to cut it with three daughters, so we contacted Duke Energy to come bump up our service. Duke has already been out and hung/trenched new lines to the house. We now have 400 AMPS!!! I love that with every new project we start we discover something else that makes us love this house even more! As the electricians started pulling wires we found that most of the house was wired in conduit. Conduit is usually only used in commercial buildings which makes Minturn special. It also makes it a lot easier to pull out all the old wiring and install new. 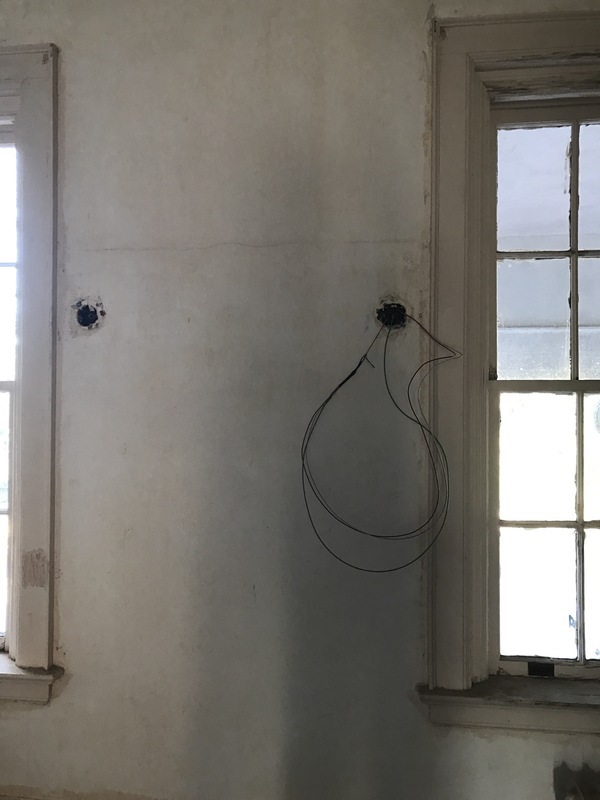 In several of the rooms there were marks on the walls where we could see holes had been patched. We opened them up and found wires that once ran to sconces. In order to run all new wires, the electricians had to open every patched hole. Some we decided to demo but we ended up keeping a lot of them open. There will be about 2 sconces in each room now! I posted on our Facebook (yes, we now have a Facebook page!!! http://www.facebook.com/minturnhouse) a picture of our new light switches and plate covers. We decided to go old school and install all new push button light switches like the original ones, but with all the new safety features. 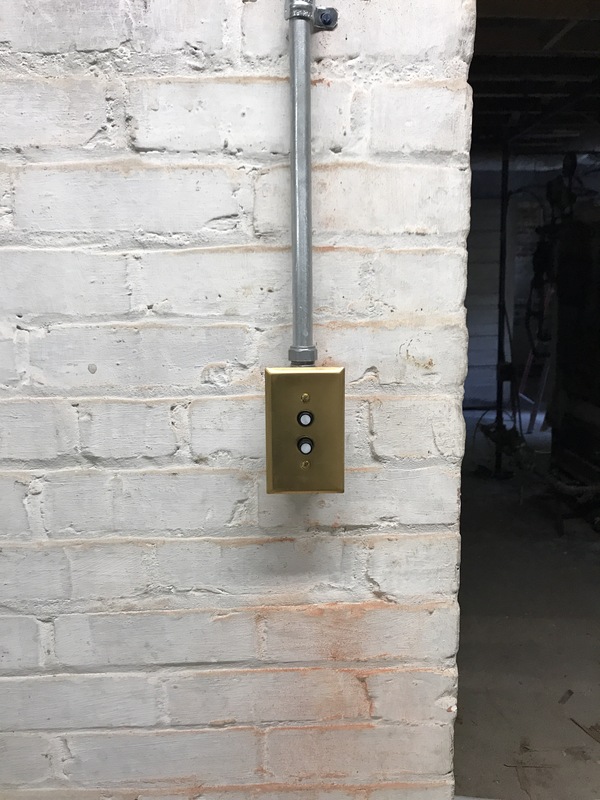 We also picked to have raw brass plate covers for the switches and receptacles to try and keep that antique look flowing. 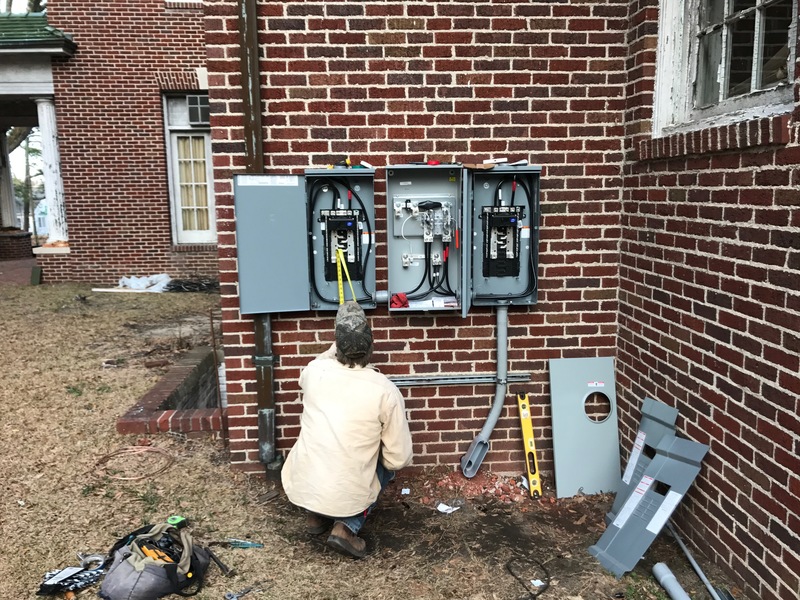 The electricians have made great progress and we are hoping all electrical will be completed in just a few short weeks! Now I just have to pick out about a thousand light fixtures, wish me luck! Your house is so fabulous! Congrats on bringing a beauty back to life! Love what you are doing to the house. I know! Made re-wiring much easier, although it was still a HUGE project!